Centuries ago, a temple set in the side of a cliff a few miles northwest of the village of Phoumi Sramol acted as the center of worship for evil adherents to the demon lord Rahb. During this time, livestock died, villagers disappeared, and plagues befell the area. Suddenly, however, all of the evil and suspicious activity around the temple ceased. Now, hundreds of years later, an occurrence in the village has the locals questioning whether or not the evil is returning. A local woman, Kanya, claims her baby was snatched from her hands in the middle of the night by followers of Rahb. The chief dismisses the temple's relationship to the missing child, suggesting the tale is a fabrication. If she is telling the truth, then there is much to be feared, and her story bears investigating... not just for the sake of the woman and the village, but for the sake of a world where this kind of evil can exist. 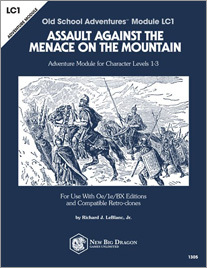 This 56-page Mongol-inspired module is designed for use with 0e/1e/BX and compatible retro-clones in a single edition. 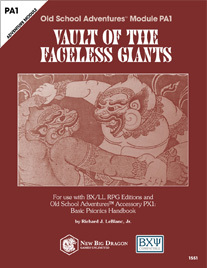 It supports sandbox-style play but includes several traditionally detailed adventures. 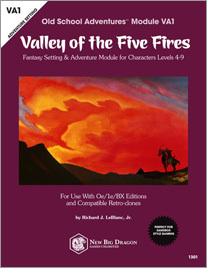 INCLUDED IN THE MODULE: new steppe shaman class, including 39 class-specific spells; information for new armor and weapons specific to the setting; a history of the Lands of the Five Fires and an area map; backgrounds on the hordes/tribes in the region (including detailed information for 10 major NPCs); 24 pre-generated classed NPCs; details on the settlements of Banua and Khuzu Kala; 4 new monsters and overviews for 29 others (including a 1-page "monster index" with stats for quick reference by the DM); wandering monster tables by terrain type; dozens of adventure seeds for horde-related and wilderness adventures; detailed encounters for the Quest of the Luuzhin Coins, including 9 encounter area maps and a wilderness map of the Valley of the Five Fires; detailed maps and complete encounter information for 7 minor adventures; 4 new magic items; and more! Watch a video walkthrough of the entire module! Recently, children from the villages around the local temple have begun to disappear. Rumors abound that the high priestess Azeneth is sacrificing them and cannibalizing them because she believes this will make her wealthier, more powerful, and more divine. 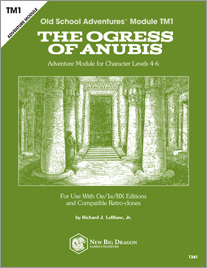 The people of the villages have begun to refer to Azeneth as the "ogress of Anubis," believing it was Anubis himself that made this woman mad, and commanded her to consume the children she sacrifices. Someone must end this reign of fear and terror, and try to return the children alive... if it is in the will of the gods. "It is the Terrible Season of the autumn, and the wild people in the mountains are preparing for the frightful ceremonies which only rumour tells of in the towns. This year the dread is even greater, for the people know that the wrath of the very old folk is due upon the town of Pompelo. Three months ago, five of the little squint-eyed traders had come down from the hills, and in a market brawl three of them had been killed. The remaining two had gone back wordlessly to their mountains... and this autumn not a single villager has disappeared yet. There is menace in this immunity, for it is not like the very old folk to spare their victims at the Sabbath. It is too good to be normal, and the villagers are afraid. A cohort has been assembled to end this menace once and for all, and there is room among the throng for more heroes, including you!" 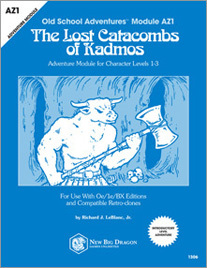 Old School Adventures Module AZ1: The Lost Catacombs of Kadmos is currently in development. Check back soon for updates. 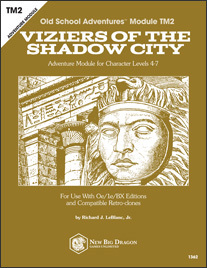 Old School Adventures Module TM2: Viziers of the Shadow City is currently in development. Check back soon for updates. 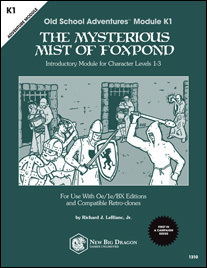 Old School Adventures Module K1: The Mysterious Mist of Foxpond is currently in development. Check back soon for updates.